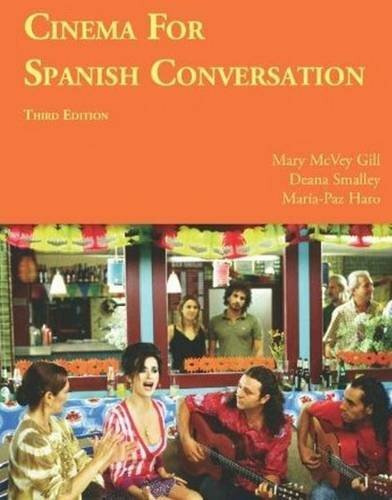 The third edition of Cinema for Spanish Conversation includes the same stimulating exercises and conversation materials that have made the first two editions successful among students and instructors alike. The text is designed to be used in courses in which outstanding films from the Spanish-speaking world are used as springboards for classroom Spanish-language discussion. Using high-interest feature films, students hear Spanish as it is spoken in different countries and in a wide variety of situations and are encouraged to listen to and converse about the social and cultural aspects of Spanish-speaking countries around the world. Changes in the Third Edition: -Five new films: La misma luna, Arráncame la vida, Machuca, Flores de otro mundo, and Volver. -Five new readings with activities in the section Más allá de la pantalla for the five new films. -Introductory information about each film, its actors and directors, has been updated. -The exercises and activities have been re-assessed throughout and in some cases revised. Manufacturer: Focus Publishing/R. Pullins Co. Brand: Brand: Focus Publishing/R. Pullins Co. Publisher: Focus Publishing/R. Pullins Co. Studio: Focus Publishing/R. Pullins Co.
View More In Humor & Entertainment. If you have any questions about this product by Brand: Focus Publishing/R. Pullins Co., contact us by completing and submitting the form below. If you are looking for a specif part number, please include it with your message.